RadiantCare is staffed by a dedicated team of physicians, physicists, dosimetrists, nurses, radiation therapists, patient care coordinators, billing specialists, and administrative personnel. Each team member plays an integral role in giving patients the most comprehensive care possible. Our Patient Care Coordinators are the first contact patients have with our facilities. They schedule appointments, obtain pertinent medical information on all patients for our physicians to review, and they greet and register patients upon arrival at our office. 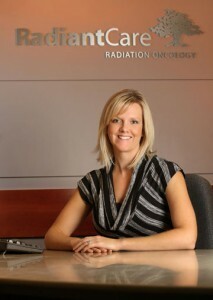 Our registered nurses are one of the primary points of contact for patients undergoing radiation treatment. They provide an orientation to therapy, help patients manage side effects and are available to address the patient’s physical, emotional and supportive needs. Based on the treatment plan developed by the radiation oncologist, our nationally certified physicists and dosimetrists ensure that radiation treatments are designed and calculated appropriately. The physicists also calibrate the treatment machines used to deliver the radiation therapy. Our radiation therapists are nationally certified and are responsible for positioning the patients on the treatment table and operating the machines that deliver the radiation. Daily interactions enable the therapists to be a primary point of contact for the patients. Our billing specialists are patient advocates that assist our patients with claims processing, authorizations, patient payments and community-based assistance. Our administrative team handles business and operational functions for our clinics. They are available to support the physicians, staff and patients of RadiantCare.